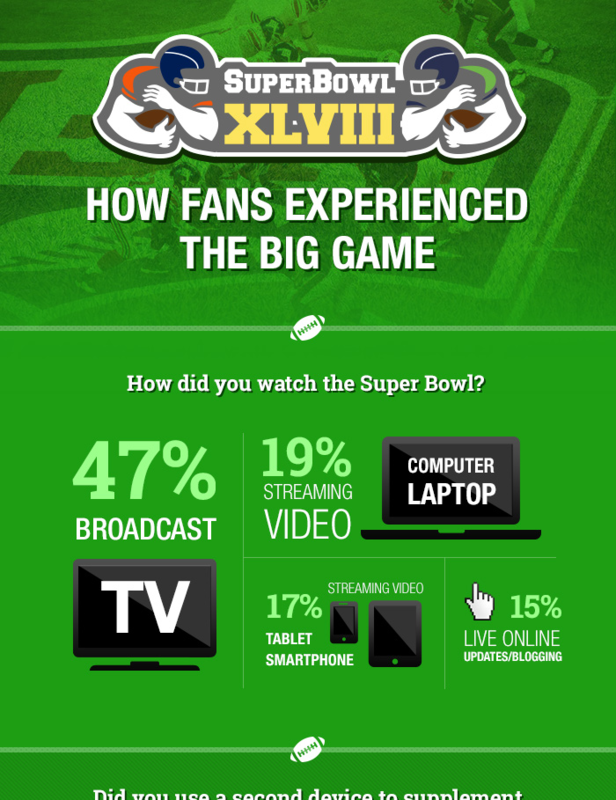 Super Bowl Follow Up Survey - How did Consumers Watch the Super Bowl? QuestionPro, Inc, an online survey software provider, announced the results of its 2014 Super Bowl wrap-up survey. The company surveyed Americans about their technology and social media usage while they watched Super Bowl 48. The results showed that viewers who used a second screen were 5 times more likely to visit an advertiser’s website while watching the Big Game. The survey also revealed users were 3.6 times more likely to search online for a product that was being advertised. 21% of all viewers surveyed visited an advertiser’s website or App upon watching their ad. They were 5 times more likely to do so if they had a 2nd screen. Click the image for the infographic!